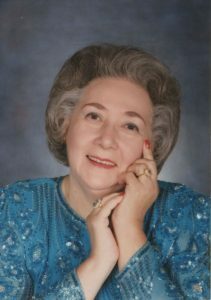 Mrs. Ruth Agnes Shelton, 88, passed away January 30, 2019. Born on October 28, 1930, Ruth grew up on a farm in Westerville, Ohio. At the age of 17, following her high school graduation, Ruth moved to Washington, D.C. beginning her career with the federal government in the secretarial pool. Married to a Navy sailor, Billy Auvis Shelton, in 1950, Ruth gave birth to her only child in 1959, Melissa Jo Shelton. Ruth was unconventional for her time as she was a wife, mother and successful career woman. Through consistent demonstration of her intelligence, dedication, and drive, Ruth was given many advancement opportunities growing into a high level budget analyst position for the U.S. Navy Department. Known for her tenacity and fairness, Ruth retired after 35 years as a government employee. Upon retirement, Ruth built a home in Alexandria, VA where she spent the next 20 years celebrating life with her many friends. After living 55 years in Northern Virginia, on January 24, 2003, Ruth relocated to Friendswood, TX to be near her daughter and only grandchild, Christopher Alan Vaughan. Proud and independent her entire life, Ruth lived alone in her own home until her death. Ruth is preceded in death by her husband Billy A. Shelton and her parents Alonzo and Lucy Fisher. Ruth leaves behind her daughter, Melissa Shelton Vaughan Browne, husband Michael; grandchildren: Christopher A. Vaughan, wife Chrissy and Brooke Browne, husband Andrew. A memorial service will be conducted at Gloria Dei Lutheran Church, Nassau Bay, TX, on Thursday, February 7, 2019, at 11:00 a.m.